Sweetie and I packed a lot into our 10 full days and one partial day in Italia. But most of the time I felt that we were keeping a relaxed pace. When I visit somewhere new, the first thing I want to do it just to walk around and get a feel for the place—first for the neighbourhood we're staying in, and then branching out from there. We did that right away in Firenze and quickly fell in love with the city. It's such an easy place to love! Our hotel was just north of Piazza Savonarola, named for the "mad monk," and we walked a few different ways to and from the centre of the city many times as well as east and west of the centre. I loved walking across the river to the Oltrarno, the area south of the River Arno, where the tourist crowds thinned out. We visited several places in the course of these walkabouts. The big tourist attraction we went to was the Uffizi Gallery, a huge U-shaped building filled with paintings and sculpture. We spent several hours there. When we came upon the iconic Birth of Venus by Sandro Botticelli, I felt emotionally overwhelmed. I had seen images of this painting so many times, but the real thing was quite stunning. We also saw numerous piazze and the churches near them, my favourite probably being the Piazza Santa Croce. 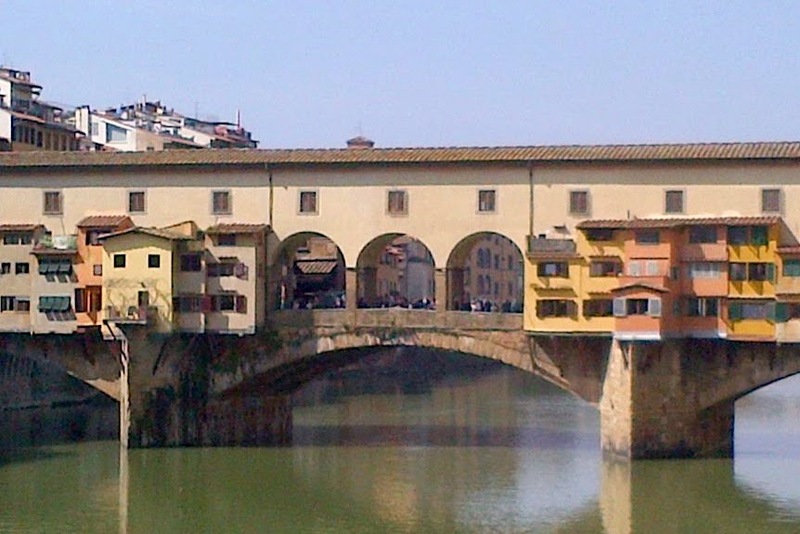 We walked across the Ponte Vecchio ("old bridge"), which is covered in shops and residences. We hit a few offbeat places as well, such as the Museo Salvatore Ferragamo, a strange little multimedia exhibit full of shoes and things about shoes. We went through the Museo Galileo, which we found by accident. It's filled with scientific instruments from the early Renaissance belonging to Galileo and others, and was fascinating. My favourite out-of-the-way place, however, was the Sinagoga e Museo Ebraico di Firenze. We couldn't take photos because their security required that we leave cameras and phones in a locker near the entrance. The synagogue is not old but is beautifully decorated. The Germans used it as a garage during World War Two and then mined it when they left, but partisans managed to defuse the mines and save the building. The museum contains two floors of sacred objects and displays having to do with the history of Jews in Firenze. I never fail to be moved by lists of names of those who were murdered in the camps. 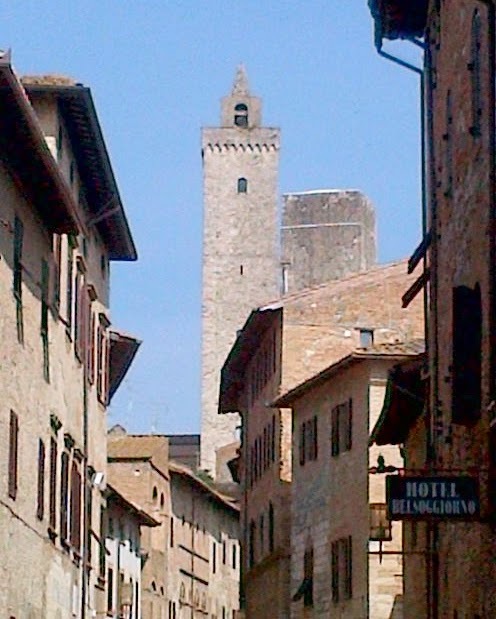 We made one day trip out of Firenze to San Gimignano, a walled medieval town a bit south of Firenze. There we visited the Duomo di San Gimignano and its associated museum, the Vernaccia Wine Museum (with tasting of the excellent local wine), and the Museo Archeologico, which houses some excellent Etruscan artifacts. And of course we also walked up and down and all around. Even though we had been in the Tuscan countryside just a day earlier, there was a bit of culture shock moving to Levanto after Firenze, but we soon settled into the tranquility. We visited four out of five towns in the nearby Cinque Terre, a protected area of medieval towns southeast of Levanto along the coast. We also took time to stroll through Levanto itself, which has been inhabited since the days of the Roman Republic. It's a town of contrasts. One minute we're looking at ancient walls and medieval foundations, and the next we're walking along the waterfront watching surfers catch the decent sized waves. There is even a surf shop in town! Staying in the country was lovely, but we are urbanites, and it was good to be in Roma after the calm of Liguria. As with Firenze and Levanto, we first walked around our neighbourhood, which is called the Prati, west of the River Tiber and not far from the Vatican. From there it was an easy walk across the river into the old city through the Piazza del Populo, the Piazza di Spagna and the "Spanish Steps," the Pantheon, the Trini Fountain, and the Piazza Barberini. Later we took a long ride on one of the metro lines to the Arcibasilica Papale di San Giovanni in Laterano (St. John Lateran), the Pope's see as bishop of Rome and the "number one" church in all of Catholicism. We're not much for tours, but we didn't have much time, and tours provide access to things we couldn't see on our own as well as allowing us to jump long queues. Both tours were run by a group called City Wonders, formerly Dark Rome. The first tour was called Crypts and Catacombs and took us to the Catacombs of Domatilla (where some of us fell behind the others as we were making our way out and were well and truly lost in a catacomb for several minutes); the Church of San Clemente, a 14th century church built on top of a fourth century church built on top of a second century Mithraic temple built on top of a first century work facility, possibly a mint; and finally the Capuchin Crypts, several rooms decorated with the bones of deceased friars and the sick people they had cared for. It was a fascinating and well-run tour, especially the "lasagna" strata of San Clemente. The second tour was a Vatican tour. Without a tour, you can wait for hours to make your way into the Vatican Museums. Once again, we had a very knowledgeable and engaging tour guide who took us through the galleries, into the Sistine Chapel, and then finally to the Basilica San Pietro. She had used a great electronic screen in the museum to go through the entire ceiling and explain what Michaelangelo had done, which was excellent, but nothing could have prepared me for the impact of the ceiling and altar artwork itself. I saw that I wasn't the only one in tears as we gathered again after our allotted 15 minutes of viewing. And then St. Peter's, including the Pieta, was simply magnificent. The only thing I didn't like about the Vatican was the huge crush of people. We saw the Colosseum as we drove by on our tour bus, but we never did get to visit it. While we were in Roma, so was President Obama. In fact, while we were touring the Vatican, he was visiting with the Pope. Fortunately, that visit didn't shut down the Vatican as his visit to the Colosseum in the afternoon did. Maybe we'll see it next time we are in Roma, as well as the Forum and the Jewish Quarter, among other sights we're interested in. And in Firenze, we have a date with the Pitti Palace and the Boboli Gardens at the very least. 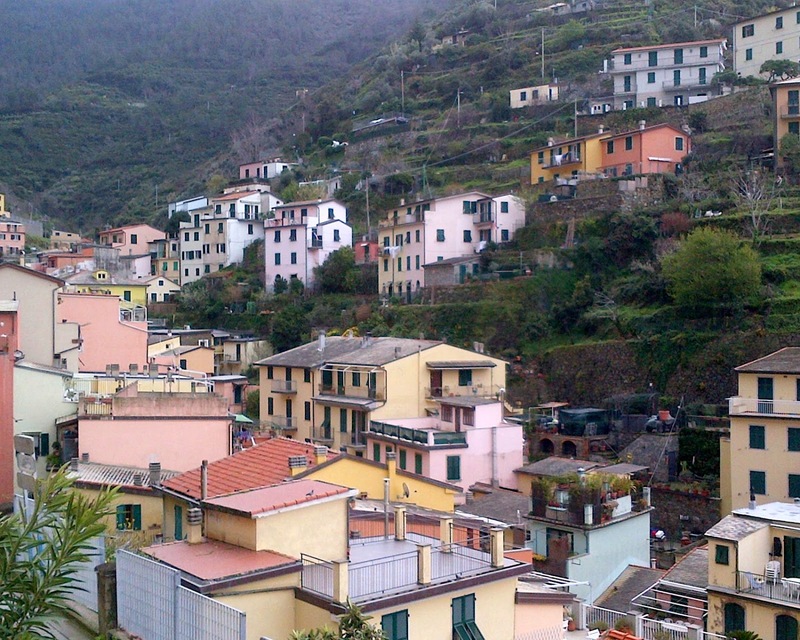 And maybe we'll make it to Vernazza, the one village in the Cinque Terre that we missed! 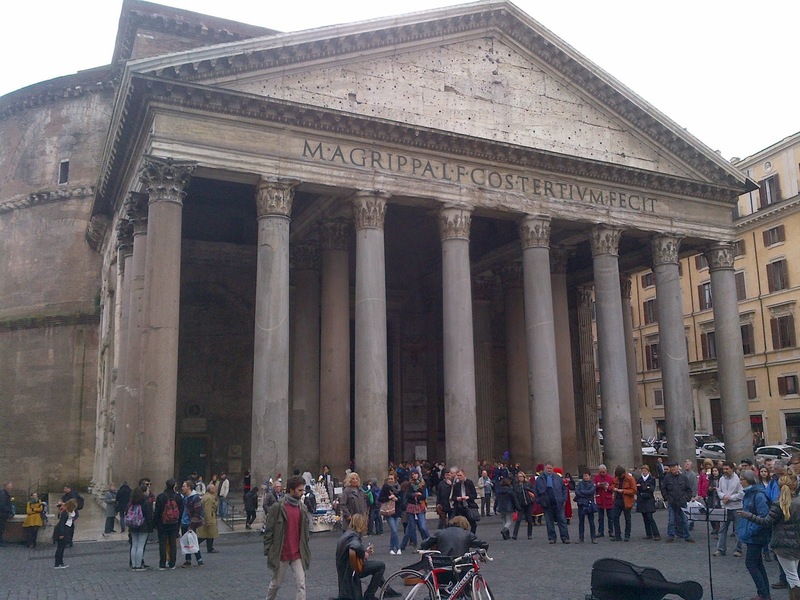 Pantheon has to be one of the greatest buildings in the world. Only hill climbing, no tower climbing, I'm afraid. I would have been able to do that myself, but Sweetie's right knee was not up to it. Would love to go to the top of St. Peter's!